Written by: Dawn Bourn on January 9, 2017. As previously announced by the CW this past summer there will be a Supergirl/Flash musical crossover! The villain of the two-part episode will be the Music Meister, as confirmed by executive producer Greg Berlanti at the Television Critics Association press tour on Sunday, reported by TVLine. The character of the Music Meister was last seen on television on Batman: The Brave and the Bold, as voiced by Neil Patrick Harris–who would be a FANTASTIC casting choice in the upcoming crossover (do you remember when NPH took on Mr. Shue (Matthew Morrison) in a battle of vocal talents in an amazing performance of “Dream On” on Fox’s Glee?) –but there is no casting news as to whether he will be reprising the role in the live action shows. For years it has been noted that the executive producers of the DCTV shows have been poaching from Broadway (and probably cloned Ryan Murphy’s phone) which had most of us who were both comicbook geeks and Broadway nerds wondering when we were going to get to hear those sweet sounds. 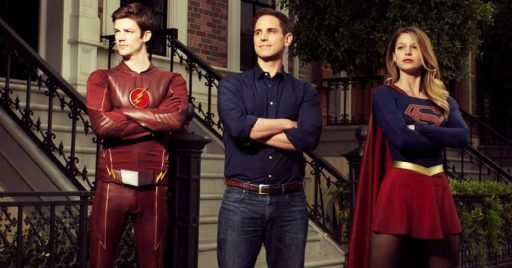 With vocal powerhouses like Grant Gustin, Jesse L. Martin, Carlos Valdes, Tom Cavanaugh, Keiynan Lonsdale, Melissa Benoist, Jeremy Jordan, Victor Garber, Arthur Darvill, Wentworth Miller, and John Barrowman on their roster it was inevitable that the Berlantiverse/Arrowverse of DC shows on the CW would do a musical crossover. While the musical crossover will only be across two of the banner shows (as opposed to all four) it will be exciting to see. Grant Gustin and Melissa Benoist last had a musical duel off on Glee’s Thanksgiving episode in season 4 when the New Directions and the Warblers competed at Sectionals. Update 1/21 (from Variety): The crossover is beginning at the end of Supergirl‘s March 20th episode, with everyone showing off their vocal talents in The Flash‘s episode “Duet” on March 21st. No casting news for Music Meister as of yet.